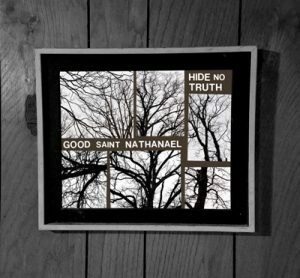 Nate Allen of Destroy Nate Allen fame takes on a dark but redemptive journey through his past, present, and future with the debut album from his new project Good Saint Nathanael. I should warn you that “redemptive” is not used here in the form that many in evangelical church circles would recognize. This is redemption that is still in process, the kind that comes from opening up your life to honesty and baring of the soul in the same manner that the various writers of the Psalms that you never read in church did. Nate Allen uses terms like “dark folk,” “good sad songs,” “bummer slowcore,” and “trauma-informed” to describe the music on Hide No Truth. Those are good starting places – I would recommend listening to Nate’s recent interview on the Down the Line podcast for more information. The music and lyrics on this album are probably some of the most soul-baring you have heard in a while. If you have had any problems with institutional religion, you will recognize yourself in these songs. Musically, many of these songs are Nate singing over simple guitars – but there are other layers in other songs as well. “Heaven” has some electrified atmospheric guitars playing in the foreground, while the acoustic guitar is played in a way that provides a rhythm. You feel like you are listening to a slow rock song until you tune in and realize there are no drums. Other times, like in “Lightening,” the electric guitars provide ambiance in the background of the acoustic guitar. There are many other sonic nuances in various songs that I won’t spoil here, but all of this to say that this is not just an entire album of one dude and his guitar and that’s it. There are layers to the music just like there are layers to the lyrics. This album is releasing February 1, so I would recommend that you get ready and go grab it when it finally does get unleashed. Your inner demons will thank you for it.